Players at a 10 Bad LARPs: Remix! run by Foam Brain Productions. Photo used with permission of Andrew Zorowitz. Alleged Entertainment is a larp writing group originally based in the Boston area, but now distributed throughout the United States. The group formed in 2003 to write the game Snaf University. 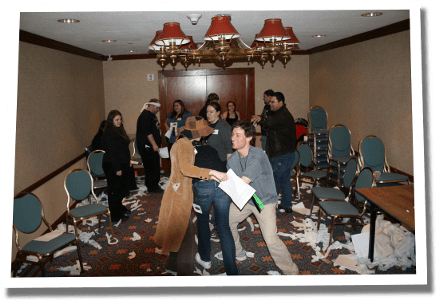 Since then, Alleged Entertainment has written and run many more larps at universities, conventions, and anywhere else we can. Larp stands for Live Action Roleplaying. Think "Dungeons & Dragons" plus improv acting. Instead of telling the GM what their character is doing, players in a larp actually take on the roles, costumes, and behaviors of their characters. Larps can run anywhere from an hour to several years. There are many different styles and genres of larp. Alleged Entertainment's games are one-shot, theater style larps. "One-shot" means that the entire game takes place over the course of one play session, which can range from 10-minutes to a weekend. The game can be run more than once, but usually players cannot play in it more than once. "Theatre-style" means that combat and similar actions are abstracted into cards, dice, or other mechanics instead of actually acting them out. Most (although not all) of these larps have pre-written character sheets with plot, history and character connections already prepared. While there may be mechanics, character sheets primarily consist of information about the character and their goals. Depending on the game, players will often fill out some sort of questionnaire in advance to allow the GMs to match players to characters and given them time to read the game material beforehand.